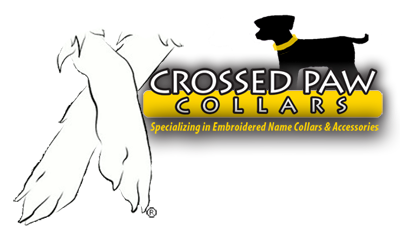 Hello and Welcome to Crossed Paw Collars! At Crossed Paw Collars we are all about the dogs. We live on a small farm in Virginia with 3 horses, 3 cats and one very special – spoiled – dog. We have always had dogs in our lives. Sushi is our current German shepherd collie mix. She had a “sister” for many years, Lady was her name. She crossed to the rainbow bridge several years ago. Lady had canine cancer but she lived through 3 surgeries and to a good age of 14. During her time with us I made many special things for Lady. She needed help walking up stairs – so we built her a ramp. I also made her a special sling to help her get up the ramp. Lady had an extensive wardrobe and Sushi carries on that tradition. Both dogs always seemed so happy when I would make them a new coat or collar. Of course nothing compared to the trips to the pet store for training and “treats”. Funny thing was they did not take anything from the stores, they sniffed what they wanted and made straight for the car, where they knew they were allowed to have the treats! I have learned from experience their collar would wear out quickly. I knew I could make something last much longer with the right material. After extensive searches, trials and errors I have found the best quality materials to make dog collars, martingales, leashes and coats. Living in Virginia we get a lot of rain. Living with a dog that had a tumor the size of a softball ( un-removable) I needed to make a coat that was quick to put on and take off with minimal stress to her and effort from me, hence our line of Crossed Paw Coats. One simple slip over her head and one quick elastic and Velcro belly strap, she could walk around the house and dry at the same time. We offer top quality products at reasonable prices. We understand dogs. They love to play rough, chew on each other’s collars and roll in “really good” stuff. 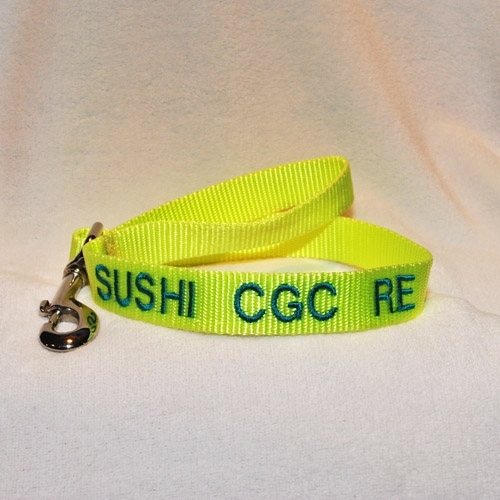 Keeping our prices reasonable allows the owner to purchase several pieces for your special dog. We enjoy attending local events, meeting new people and all their dogs. It’s really amazing to watch the owners try to walk by our booth while their dog is pulling them into our booth. As if he is saying “Wait mom – Look at all the stuff for me”. Once inside the owners see how many choices we have and that our prices our excellent. Every dog always leaves with something new like a bandana, collar or coat. The really lucky ones go home with everything and a promise to be back with friends and family. 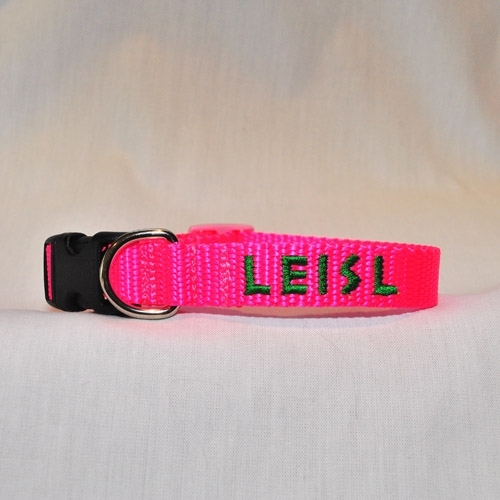 For many years I would make dog collars as gifts. A good friend suggested I try setting up a table at our local dog shows. We needed to decide quickly on a name. The show was in a month. We chose “Natalie’s Embroidery”. 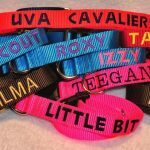 We had so much fun attending local fundraisers for the humane societies we decided to make our business official, changing the name to “Natalie’s Custom Dog Collars”. Another year passed, we realized we needed to enter the global world – hence “Crossed Paw Collars”. 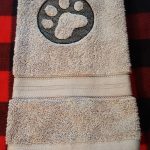 So here we are today with a .com address, Twitter, Facebook, Pinterest, Etsy, Google+ and our registered trademark Crossed Paw & Crossed Paw logo. Look for the Crossed Paw on all our products! Enjoy shopping on our site and when you see us at an event near you be sure to stop by and say hello.